This book describes the development and operation history of the Hs123. It contains: superb colour illustrations of camouflage and markings, rare b&w archive photographs, and scale plans. Essential reading for aviation enthusiasts, historians & scale modellers. Play with Hs 123 interactive instrument panel. Well-written text; generally high quality period photos; excellent line drawings and colour artwork. This is a solid dissection of a less well-known, and covered, World War 2 aircraft. You won’t regret having it on your bench if you are undertaking an Hs 123 project, or on your bookshelf if you’re interested in Luftwaffe or broader aviation history. The Henschel Hs 123 was one of the Luftwaffe’s longest-serving aircraft: it first flew in 1935 and remained in frontline service until 1944. This is despite a total production run of fewer than 300 aircraft that ended before World War 2, by which time the Hs 123 was clearly obsolescent. Conceived as a dive-bomber, the Hs 123 found its niche as a ground attack platform able to operate in conditions unsuitable for many other aircraft. After Germany’s surrender the type soldiered on in Franco’s Spain until the early 1950s, when the last examples were scrapped. Introduction. This two-page chapter outlines the reasons for the Luftwaffe’s early interest in acquiring a dive-bombing capability, which led directly to the Hs 123’s design. Unfortunately an accompanying photo of one of the Hs 123’s ground attack predecessors from the First World War, a Junkers J.1, is mislabeled as an ‘Albatros J.1’. Creating the design. Really an extension of the introduction, this chapter briefly examines the history and wartime role of the Henschel aircraft company. Development. Here Panek describes the Hs 123 prototypes – V1 through V8 – and the various refinements along the way that resulted in a design ready for production. There are fair to good quality photos of each aircraft except for the V8, which was in fact the V2 re-engined with a BMW 132A-3 engine (it had originally been fitted with a Wright Cyclone GR-1820-F52). There are also three pages of full-colour artwork, the first of 37 such pages throughout the book which show the wide variety of finishes applied to the Hs 123 by its various operators. Series Production. The two production variants – Hs 123 A and B – are described in text before being exhaustively illustrated in ten pages of line drawings and period photos. Changes introduced during the production run (and other anomalies) are highlighted. There are also brief written descriptions of the several production machines used as test beds, as well as the proposed (but not produced) Hs 123 C, which would have had an enclosed cockpit and additional guns. Technical description. Here we take a short diversion from the Hs 123’s evolution and use, and examine the airframe in detail. All major sections of the aircraft are covered in both writing and illustration (mainly line drawings from wartime technical manuals). There is also a handy one-page table setting out the Hs123’s technical specifications. Luftwaffe service. Unsurprisingly the longest chapter in the book, this section begins with the Hs 123’s entry into German service in 1936 and its use by the Legion Condor in Spain. World War 2 campaign use follows: Poland, France and the Balkans followed by Operation Barbarossa. The Hs 123’s simplicity and ruggedness saw it perform comparatively well in the tough Russian conditions, but by 1944 the surviving aircraft were both worn-out and hopelessly outclassed by their Soviet opponents, and so withdrawn from the front. The Hs 123’s important contribution is well covered, with some fascinating period photos of both machines and the conditions in which they operated; there are also many lavish colour profiles. Foreign service. The Hs 123’s Spanish service is well known, both during and after the civil war. 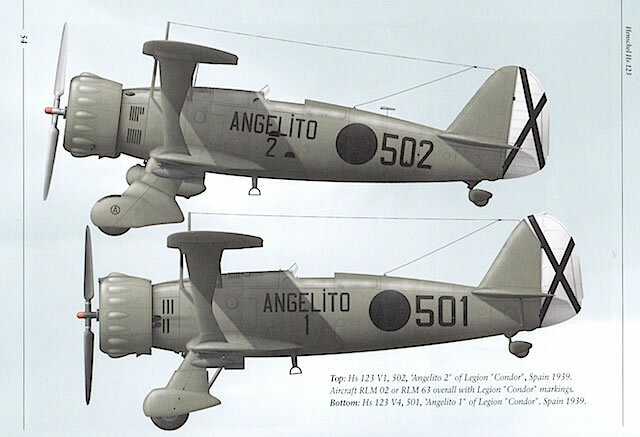 Less familiar are the 12 aircraft purchased by the Chinese Nationalists in 1937 and used operationally, including against the Japanese, until late 1939. Both countries’ experience with the Hs 123 is described in detail, as are the machines themselves through profiles and photographs. 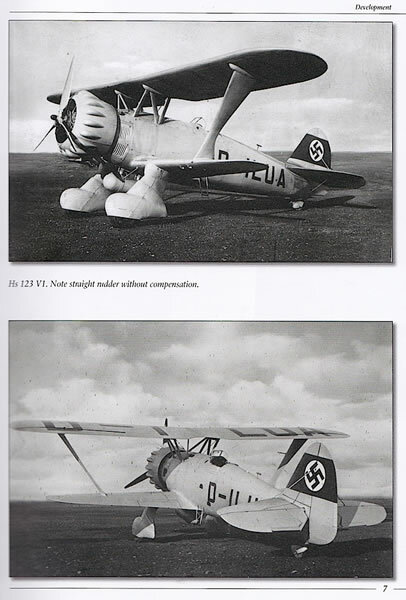 The chapter ends with a short section on two foreign sales that didn’t come through: by Austria (which was absorbed into the Reich before the planes were delivered) and Portugal, which decided to buy Breda Ba.65s from Italy instead. Detail photos. The final 28 pages of detail illustrations – both photos and line drawings – will be an essential reference for anyone building a Hs 123 model. The airframe is examined from every angle, with the cockpit covered in particular detail; the full colour instrument panel is a highlight. The final two pages address stores carried by the Hs 123. Overall production values are high. The text is workmanlike but easy to read, with no typographic errors that I saw. The quality of the period photos varies, but this is more a reflection on the available source material than MMP’s reproduction techniques. Captions are succinct and – apart from the error noted above – appear to be accurate. The colour illustrations are by Chris Sandham-Bailey and one of the book’s strongest features; it’s hard to leaf through without being distracted into contemplating future projects. The absence of both contents page and index is slightly frustrating, but because the book is well laid out and comparatively slim, it’s fairly easy to find what you are looking for. This is another solid dissection by MMP of a less well-known, and covered, World War 2 aircraft. You won’t regret having it on your bench if you are undertaking an Hs 123 project, or on your bookshelf if you’re interested in Luftwaffe or broader aviation history. I’m looking forward to more similar titles in the future. Announced all of two years ago this Mushroom Hs123 title finally appeared in late June 2014. It is in the usual format of the Orange series: multiple small sections building up to a summary history, a brief technical description, plus 41 pages of full colour paintings and a concluding part of well reproduced drawings from the Luftwaffe Flugzeug-Handbuch. The book includes a good selection of photographs which does go well beyond the old favourites. In general, the book has been well researched adding much information that is new in English. This title is a definite must-have for anyone with more than a passing interest in the Hs123. A very useful preview of the book contents has been posted on YouTube by the publisher. Unfortunately all of the colour paintings are printed on the usual Mushroom background of an uneven sky blue. Modern no doubt but representationally unhelpful. Hopefully Mushroom will develop a better approach in future titles. If the background cannot be white why not a plain, uniform very pale grey wash? Also where page numbers are printed on top of photos they can become very hard to read see p.59. White page numbers would be better on dark photos. A short section on flying characteristics would also be a welcome addition in these titles. From the few snippets that have surfaced those of the Hs123 seem to have been superlative. The book has a QR patch on p.119 which I have not used. However, a URL is also given. These allow the viewing of a drawing of the instrument panel. Personally, I was a little underwhelmed by this interactivity but maybe this technology will take us to more interesting places in the future. Historically, the Hs123 is a particularly significant aircraft. A miniscule 230 or so were taken into service by the Luftwaffe, a tiny investment from which the Luftwaffe squeezed an extraordinary amount of work over the front lines through an astonishingly long period (to at least the spring of 1944). Specific details are thin but the battlefield contributions of the Hs123 seem to have been out of all proportion to the tiny numbers employed. The Hs123 is probably the most remarkably cost-effective ground attack aircraft of all time and the story of its longevity is genuinely extraordinary. Unfortunately the early part of this story is marred here by two entirely avoidable errors: 15 not 16 Hs123A-0 were built, the first batch of seven machines spanning WNr. 0628 to 0634, and the WNr. 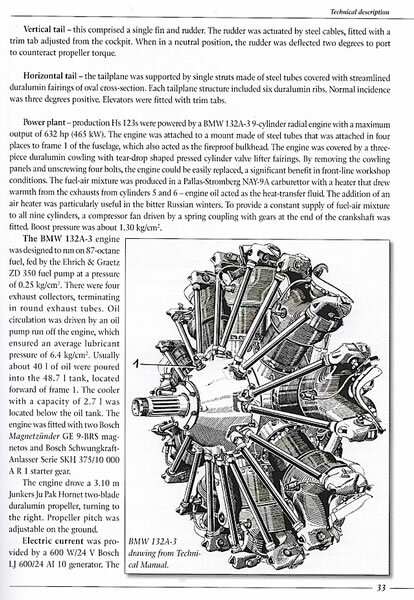 of the Hs123V-5 was 796 (not 769 as printed here on p.16, and in so many other places). These corrections were published in Horst Maternas 2010 book. Thus the Hs123V-5 & Hs123V-6 were assigned the WNrn. immediately after those of the second batch of Hs123A-0s. According to this publication, this made them respectively the 16th production Hs123A-1 (p.16) and the 17th aircraft of the Hs123A-1 production version (p.17) respectively. In fact, they would have been the 16th and 17th Hs123A-0s, if they had actually been intended as Hs123A-0s. However, they werent, so both statements are entirely fatuous and need to be struck from the text. A few other important corrections are also necessary. Total production of the Hs123 was 262 (not the 266 given here on p.23). This comprised: 7 Versuchs, 15 Null-Serie, and 100 Serie (including the 12 commercial exports to China) from Henschel, Berlin-Schönefeld, plus 140 Serie (not 129 as stated on p.23) from AGO at Oschersleben-Bode. These totals are definitively documented in the Technischer Bericht sections of the Henschel companys annual reports for 1942 and 1943. Thus the 12 Hs123 exported by Henschel to China were diverted from the production series ordered from Henschel for the Luftwaffe, whilst the 12 Hs123 sold to Spain in 1939 were a government-to-government sale of aircraft taken directly from Luftwaffe stocks. Each export case underlines the point that the Luftwaffe by that time already considered the Hs123 to be obsolescent and now superfluous. But then dedicated ground attack aircraft have never ever been popular with air force hierarchies, even young ones. On the other side of the ledger, there is a photograph of truly outstanding interest at the foot of p.53. This can indeed only be a shot of the Hs123V-1 in Spain. The Hs123V-2 had become the Hs123V-8 and the Hs123V-3 had been destroyed. The much beefier fuselage struts only fitted to the first three prototypes are clearly evident here. One significant change from the original configuration of the Hs123V-1 is that the clumsy, over-large boots over the main wheels have now been replaced by the neater fairing introduced on the Hs123V-3 (photo at p.13 here). These fairings were fitted with black non-slip pads on the upper front portion, a solution that was not adopted for any other Hs123. Immediately behind the Hs123V-1 this shot also captures the sole example of the He50 dive bomber trialled in Spain. Presumably Angelito 501 and 502 were never used operationally in Spain. This Mushroom title also makes one important correction to the story of the Hs123 so far as this has been printed in English. (Although this has been available in German sources since at least 1974). The difference between the Hs123A-1 and Hs123B-1 sub-types was not down to whether or not a faired headrest/rollover pylon was fitted or any other such fancy, but was entirely a matter of whether fabric or duralumin was used for most of the skinning on the upper surfaces of both wings and in the internal construction details of the ailerons. As the Fz-Handbuch commented, to determine whether a particular example was an Hs123A-1 or a Hs123B-1 sub-type it was necessary to check the manufacturers plate of the aircraft. For the other few nit-picker specialists of my own micro-species, it will be noted that a few of the Hs123 W.Nrn. mentioned here are clearly inaccurate. 1. p.59(text), WNr. 816 is probably WNr. 819, the lowest numbered Hs123A-1 known to have been built by Henschel. This was preceded by a batch of JuW34. p.74(top) unit is 8./SchG1 (not 8. (Pz)/SchG1) and was only briefly equipped with the Hs123. The separately distinguished and designated 4. (Pz) & 8. (Pz) Staffeln did not come into existence until the Dec42 reorganization into two Schlachtgeschwader. This photo, however, dates from the period Jan/Mar-42. Subsequently, in April-42 8./SchG1 was returned to Germany and re-equipped with the Bf109E-7 Jabo. A newly-formed 7./SchG1 was then equipped with the Hs123 as operational needs were pressing, pilots were available and it would be many months before sufficient Hs129s could be produced. p.130 aircraft is L2+BP of 6. (S)/LG2 (not +BH). This makes no pretence of being a comprehensive listing. Also ignored is the generous sprinkling of typos. Overall recommendation: Strong buy and hold. As with other titles in the Mushroom Orange series (Hs126 & Hs129 immediately come to mind) this is not the final, definitive account. It is, however, still a most useful, well-produced and very affordable addition to the literature on the Hs123. MMP’s latest volume in their “Orange Series” covers the Henschel Hs 123. The book is published on high quality smooth paper, in-between glossy stiff stock covers. On first inspection this appears to be of the same high production quality I have found in all other MMP productions. Lots of clear photos and nicely-done color plates appear throughout the book. 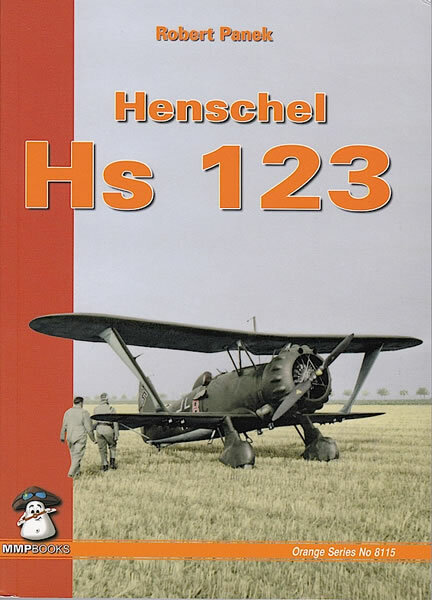 In a similar manner to other titles in this series, this book starts with several chapters covering the design and development of the Hs 123 (about 30 pages in ll). Throughout each of the chapters in this section there are numerous 1/72nd scale drawings depicting either the entire aircraft, or a particular feature thereof. This is followed by a chapter titled “Technical Description.” Here, as one might expect, the technical specifics of the design are laid out (ie, single-seat sesquiplane of metal construction…. 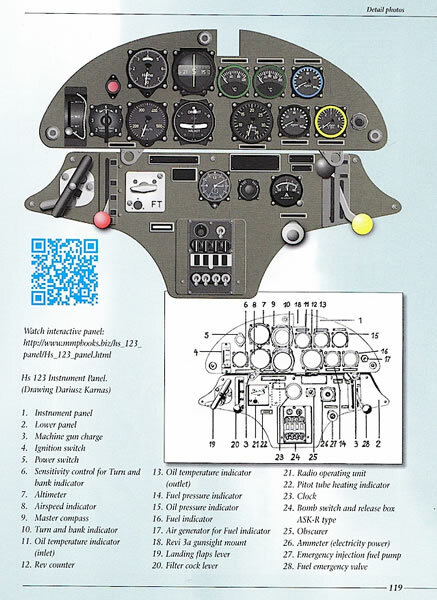 ), and the text is accompanied by drawings from the actual Technical Manual of the aircraft. Following the design section, the next 50 or so pages of the book cover operational usage, with chapters on the pre-war period, Legion “Condor,” the Polish and Balkan campaigns, Operation “Barbarossa,” and the Eastern Front 1942-44. Appropriate pictures and a lot of nice color profiles are present here. Several of the profiles include top and bottom views as well. Immediately after this are 12 pages covering foreign use of the Hs 123 (basically Spain and China). Here again are some nice photos and plenty of color profiles. The last 28 pages of the book, delineated by light blue colored pages, are filled with detail photos covering every aspect of the Hs 123. This is broken down into sections such as cockpit, wings, landing gear, etc. There are a great deal of contemporary photos in here, as well as some drawings from technical manuals and some artist renderings. This is just what the detail-oriented modeler would want – good detail photos and drawings of landing gear, engine, cockpit, etc. Unfortunately, there are no remaining Hs 123s, so clear detail photos of museum aircraft (present in this section of many other MMP books) won’t be found here. Considering the photos in here were never taken with the modeler in mind, I think MMP did an admirable job of collating detail shots! While numerous 1/72nd scale plans are included in this book, several other MMP books come with inserts that fold out into 1/48 and 1/32 scale plans of the subject matter. This time around these are not included, but are available for purchase as a separate volume (advertised on the back cover of the book). One intriguing insert is present however, and it’s from Gaspatch Models. While one side of this insert promotes their line of 1/48 and 1/32 accessories for biplanes, it is the other side that is particularly interesting – it announces Gaspatch’s newest 1/48 model, appropriately an all new-tool Hs 123! This is the first notice I have seen of this kit anywhere, and as of this writing have not heard a peep about it on any of the modeling boards I frequent. The few reviews I have read of Gaspatch’s first kit, a Salmson 2A2, were quite favorable, so I am looking forward to this Hs 123 release. MMP’s Hs 123 book is another worthwhile addition to your library, provided you are interested in the subject matter. There are loads of photos and drawings that will provide excellent detailing information and the color profiles will certainly provide some modeling inspiration. Whole-heartedly recommended! Thanks to MMP Books for the review copy and to IPMS for allowing me to review it. OK, I admit it: I really like MMP aircraft monographs. Compact, colorful and convenient, they deftly distill their subjects. Especially for modelers of more obscure types. And that's why I love their latest. MMP's Henschel Hs 123 – part of the publisher's "Orange Series", and available in North America from Casemate – packs everything you need to know of this brazen little biplane into just 136 pithy pages. The pithy précis recaps design, development and deployment – over Spain, China, Poland, France and the Soviet Union. 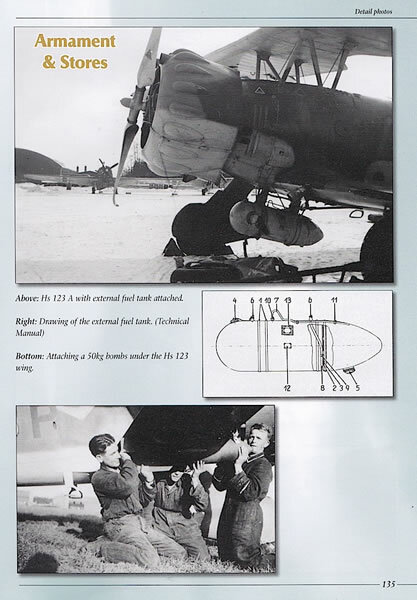 During Operation Barbarossa, for instance, the Henschel Hs 123 was "'the only Luftwaffe aircraft during winter 1941/42 [that] was able to fly attack missions from airfields covered with deep snow in the Eastern Front area'." And it remained in albeit limited Spanish service until 1952! Author Robert Panek seasons his superb study with technical minutiae, dozens of vintage and detail shots, service manual excerpts, and 1:72-scale plans. A selective bibliography and 41 pages of excellent artwork by Chris Sandham-Bailey augment this vital volume. And just why is it "vital", you ask? Just read MMP's Crackerjack Prize: GasPatch Models' insert for a new 1:48-scale Hs 123! The pending product promises multiple versions (A-1 and B-1), different wing configurations, "separated" control surfaces, a "highly detailed engine", and both "full spatted and unspatted wheels". I'm licking my eyebrows! Plagued by limited range, Henschel Hs 123s often served close to front lines. So valuable were the little biplanes that they only left front line service during the first half of 1944. For an excellent account of this cool, comely combatant, grab MMP's terrific little tome. It's certainly seized pride of place among my Luftwaffe references! The lead up to the Second World War saw each side take different concepts as a primary goal. While the British and American forces saw benefits in strategic bombing, the Germans and Russians focused on close air support. On the German side, the immediate push came to develop a solid close air support aircraft, and out of that requirement the Hs 123 was born. After a testing period that employed a handful of prototype variants, production of the Hs 123 took place in the mid-1930s, with the first operational units receiving theirs in 1937. The plane was reaching obsolescence by the time war broke out in 1939, but the Hs 123 remained in front line service for many years, with some remaining until the last year of the war. This latest title in the Mushroom Model Orange Series provides a detailed examination of this early war attack aircraft. Each variant gets a brief description, combined with scale drawings. Throughout the book are plenty of photographs showing the Hs 123 from various angles, as well as close up details of both period and museum examples. Scrap view drawings from tech manuals are also included, as are some nicely detailed color profile illustrations. The book also covers some of the foreign operators of the Hs 123, and these too are portrayed in color profiles. The Hs 123 is a plane that is often overshadowed by other Luftwaffe aircraft, but its interesting look, coupled with its longevity in the face of obsolescence, makes it a great subject for this book. Anyone seeking inspiration for colour schemes will find plenty in the high quality profiles that intersperse the historical section. 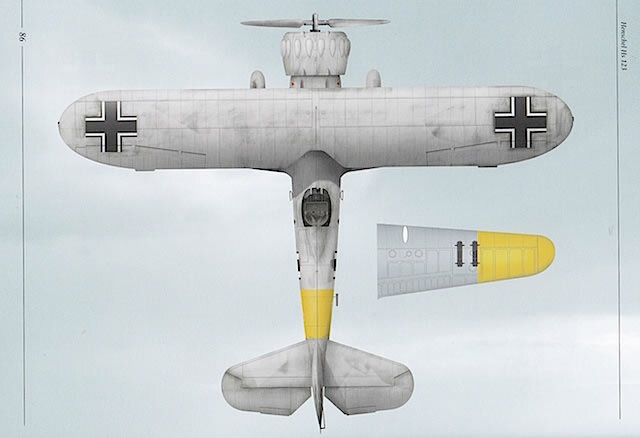 The Hs 123 is illustrated throughout its career, from its early Luftwaffe and Condor Legion days, through the early successes in Europe and the bitter fighting in the East, to a selection of really interesting foreign service schemes in Spanish and Chinese colours.